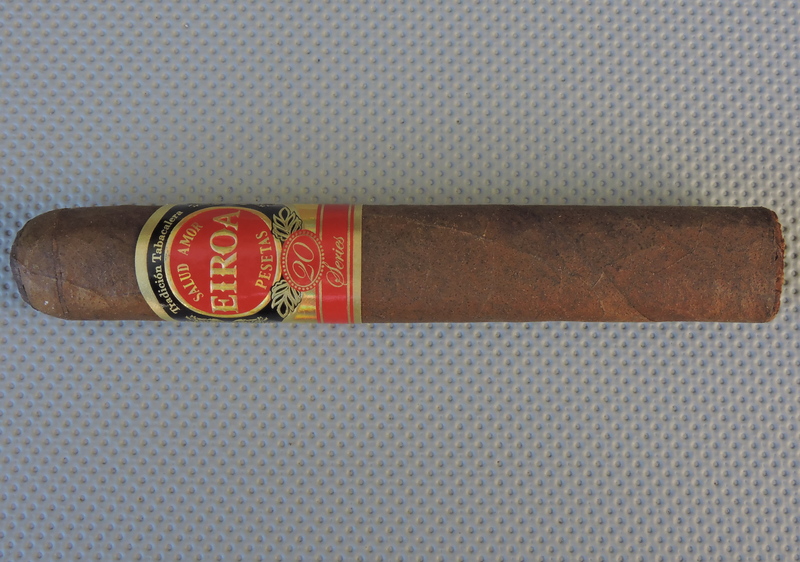 Eiroa – The First 20 Years is the third blend in CLE Cigar Company’s Eiroa brand. 2015 marked CLE founder Christian Eiroa‘s 20th anniversary in the cigar business. To commemorate the occasion, Christian’s father, Julio Eiroa presented him what he considered to be some “very special tobacco” . 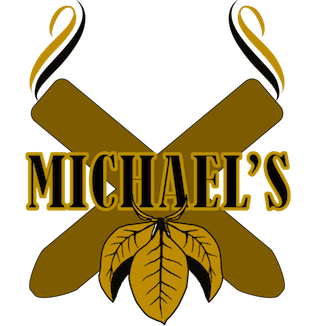 Christian took the tobacco and created a blend. The result would be the Eiroa First 20 Years release. 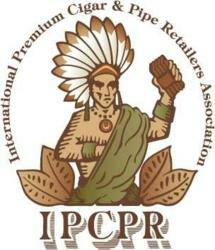 The cigar was officially unveiled at the 2015 IPCPR Trade Show in New Orleans. Recently I’ve had an opportunity to smoke the Eiroa First 20 Years in the 50 x 5 (Robusto) size. 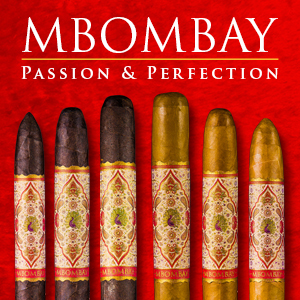 Overall I found this to be an excellent cigar ranking among the best offerings in the CLE portfolio. 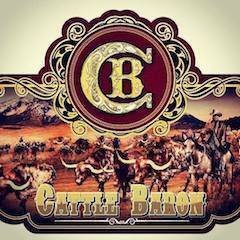 In 1995 the Eiroa family purchased Camacho Cigars. 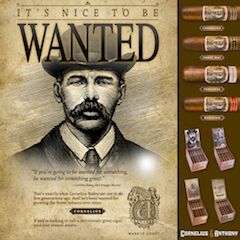 Eventually Christian would take the helm at Camacho Cigars, and in 2008 he made a decision to sell the company to Oettinger Davidoff. 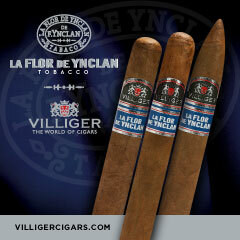 In 2012, after a stint at Davidoff, Eiroa would form CLE Cigars. The CLE portfolio would grow into one of many brands, one of which is the Eiroa brand – one that pays homage to his family’s heritage. 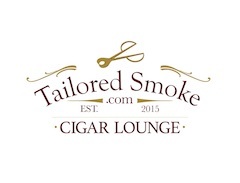 It makes the most sense that The First 20 Years cigar would be a part of that brand. 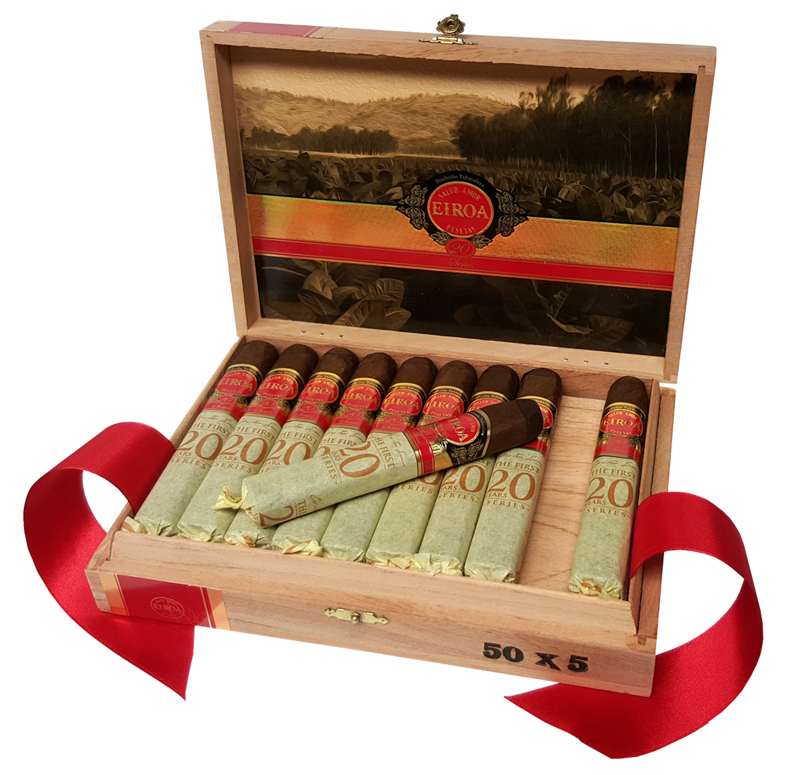 Without further ado, let’s take a closer look at the Eiroa First 20 Years 50 x 5 and see what this cigar brings to the table. As mentioned the Eiroa First 20 Years is a Honduran puro. There are four box-pressed sizes of the Eiroa First 20 Years series. Each of the four sizes is packaged in 20 count boxes. The Honduran wrapper of the Eiroa First 20 Years 50 x 5 has a medium / dark brown color. Depending how the light hits it, there may be a slight colorado tint. Upon closer examination, some darker marbling can be seen on the wrapper. The wrapper itself has a light coat of oil. There are some thin visible veins as well as thin visible wrapper seams. The box-press has a slight rounded effect. The box-press is firm with no soft spots. The Eiroa First 20 Years features a red, gold, and black colored band. The upper part of the band has a similar design to the original Eiroa. There is a red circle with gold trim at the center of the band. On the center of that circle is the text “EIROA” in large gold font. Surrounding the “EIROA” name is “SALUD”, “AMOR”, and “PESATAS” in a smaller gold font. The remainder of the upper portion of the band has a black background. Sitting on that background above the circle is the text “Tradicion, Tabacalera”. There are gold adornments surrounding the circular background. To the left and right is a gold pinstripe pattern. On the left pinstripe pattern is a gold small rectangular nameplate design with the text “DESDE 1916” in black font. There is a gold holographic-style background below the upper portion of the band. At the center of that holographic portion is a red oval with a gold “20” on it. Below that is a thick red stripe with the text “Series” in gold cursive font. A gold pinstripe is on the upper and lower portion of the red stripe. The upper and lower portion of the band as a whole has gold trim. Finally from the footer of the cigar to the band is a pale yellow tissue wrap. The wrap is twisted at the footer. On the tissue wrap (stamped in multiple places) is the text “The FIRST 20 YEARS Series” in gold font with the “20” in a larger font. Above that text is Christian Eiroa’s signature. 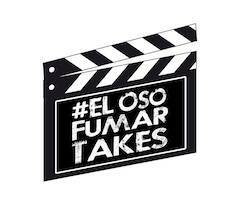 Eiroa told us on Episode 150 of Stogie Geeks the tissue paper is used because of his aversion to using cellophane to protect the cigar. 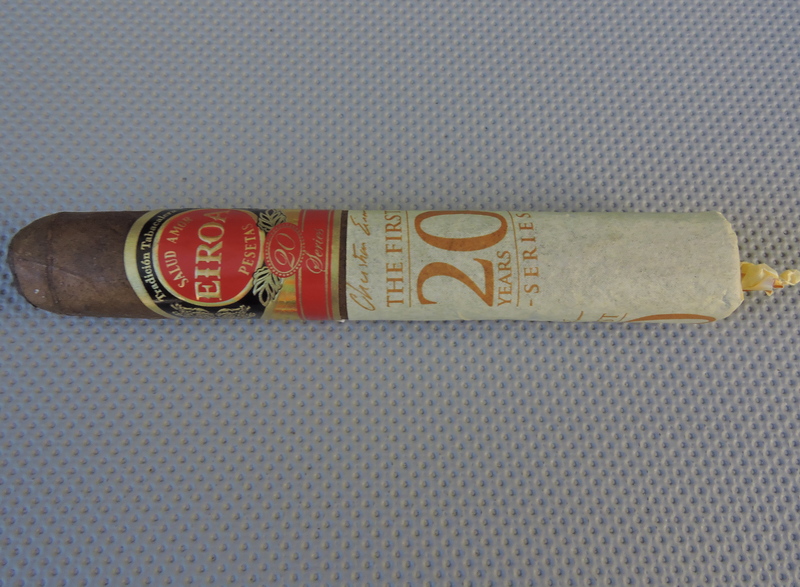 Prior to lighting the Eiroa First 20 Years 50 x 5, I first removed the tissue paper covering on the cigar. From that point I placed a straight cut to remove the cap. After successfully clipping the cap, I moved on to the pre-light draw. The cold draw delivered notes of earth and light natural tobacco. There also was a subtle, but crisp cedar note present. Overall I considered the pre-light draw of the cigar to be excellent. At this point I was ready to light up the Eiroa First 20 Years 50 x 5 and see what the smoking stage would have in store. The Eiroa First 20 Years 50 x 5 started out with notes of white pepper. As the white pepper settled down, notes of earth emerged. This was followed by notes of coffee, cream, and a slight amount of lemon-grass. All of these notes very much had a tobacco undertone to them. While the white pepper settled into a background note, it remained prominent on the retro-hale. By the middle of the first third, the lemon-grass notes increased and moved into the forefront with the coffee and earth notes. These three notes alternated in intensity and complemented each other very nicely. The white pepper remained in the background along with the cream notes. By the midway point, the lemon-grass and earth notes remained in the forefront. The coffee notes receded joining the pepper and grass notes. The cream notes started to dissipate. Later in the second third, the coffee notes increased again joining the earth notes. Meanwhile, the lemon-grass notes joined the pepper notes in the background. While there was a slight increase in pepper in the last third, the flavor profile remained the same. At the end of Eiroa First 20 Years, the resulting nub was firm to the touch and cool in temperature. From a burn perspective, the Eiroa First 20 Years 50 x 5 scored nicely. The cigar had no problem keeping a straight burn path from start to finish. While the burn line was slight curved, there was no jaggedness to it. This was a not a cigar that required frequent touch-ups. The resulting ash was tight and on the firm side. There was a nice white color to the ash with some darker speckling mixed it. Both the burn rate and burn temperature were ideal. The draw to the Eiroa First 20 Years 50 x 5 also scored nicely. The draw was not too loose, nor too tight. 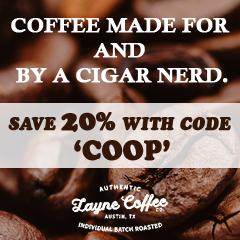 This resulted in a low maintenance cigar to derive the flavors this cigar had to offer. This cigar was positioned as somewhat of a dialed back cigar. However, I still found this to be a cigar that had some boldness to it. The strength level was high enough to be considered medium to full in my book. On the other hand, the flavors were robust enough to be considered full-bodied in my book. I didn’t find a lot in the way of variance of strength and body as this cigar smoked. When it came to strength versus body, I did give the edge to the both. 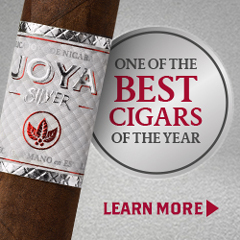 The Eiroa First 20 Years was the showcase cigar of what was a very busy 2015 IPCPR Trade Show for CLE Cigar Company. As a result there was plenty in the way of expectations with this cigar. In terms of meeting those expectations, I found this to be a cigar that came through with flying colors. The original Eiroa cigar was a very unique Honduran puro. With the Eiroa First 20 Years, CLE delivers another unique Honduran puro. The only thing I don’t have a read on is how this cigar will perform with age. My gut tells me the profile will dial back more into the “medium-bodied” range advertised with this cigar. For now, I found this to be an excellent cigar. 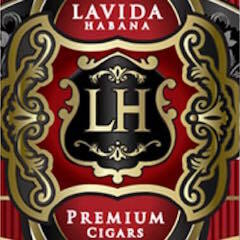 Right now this is a cigar I’d recommend to an experienced cigar enthusiast. At the same time, this is a cigar I’d recommend to a novice looking to graduate to something fuller. 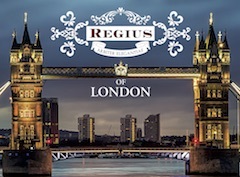 As for myself, this is a cigar I’d smoke again – and pick up a box of. I have to agree with Charlie. The whole line is good, but it’s Prensado the really sticks out.